Coming soon Anacostia River Realty's new reality show! 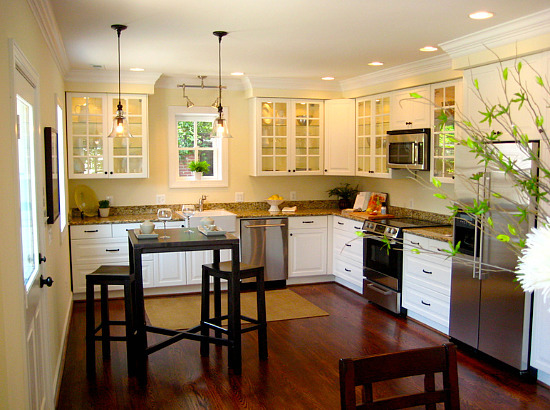 Anacostia River Realty is frequently mentioned in leading local and national media. The sales have implications for the larger neighborhood. Real estate agent Darrin Davis told UrbanTurf that the fact that units at Sheridan Station are now appraising may be used to encourage other developers to move forward with projects in Ward 8. According to Darrin Davis of Anacostia River Realty, even Congress is investing East of the River; Ohio Congressman Dennis Kucinich and his wife recently bought a home in Hillcrest, just to the east of Historic Anacostia. Such is the case with Bentley Plummer, a business partner of Anacostia River Realty's Darrin Davis, who owns bits and pieces of land at the intersection of Minnesota and Pennsylvania Avenue SE. For the past few years, Plummer has been convincing the several property owners to participate in a new development, and now says he's gotten signatures from people who collectively make up about 80 percent of the site (five owners have yet to be approached). They'd like it to be mixed use, with housing as well as retail and office space, or potentially some kind of medical center. But that will depend on whomever they find to actually develop the project. Today in Realtorspeak: Anacostia Über Alles! ...Anacostia itselfï¿½"a small neighborhood centered around an historic coreï¿½"may be having its troubles with foreclosures and vacant properties, as I describe in this week's issue. But it's still the most recognizable brand in Wards 7 and 8, and rather than fight the perception that that's what everything east of the river is called, Anacostia River Realty's Darrin Davis has decided to embrace it: He's now marketing the entire area as the "Anacostia Neighborhoods." The foreclosed and vacant units create good deals for investors, who Darrin Davis of Anacostia River Realty says account for about 60 percent of sales in the area. The investors pay bargain-basement prices, which also depresses values. But even if they’re just looking to make a buck off the neighborhood’s troubles, at least they’re making the units livable and renting them out. Despite low inventory across the District, even the stuff that is for sale around there has been moving very, very slowly. Darrin Davis of Anacostia River Realty tells me that he's tried everything to sell units in the brand-new Savoy Court condominiums: Offered a one-year break on condo fees, $5,000 towards a down payment, even a free Smartcar with the purchase of a condo. BOUNDARIES: Historic Anacostia is roughly bounded by Good Hope Road SE to north, Martin Luther King Jr. Avenue SE to west, 16th Street SE to east and Morris Road SE to south. SCHOOLS: Savoy Elementary; Kramer Middle; Anacostia High. He moved into his 105-year-old wood-frame home five years ago, and founded the Historic Anacostia Block Association to improve communication between young professionals moving into the neighborhood and older, longtime residents. Darrin Davis, 46, owner of Anacostia River Realty, said a host of young professionals have moved into the neighborhood in recent years, attracted by inexpensive historic houses and proximity to downtown Washington and Northern Virginia. The neighborhood also boasts historic and cultural resources such as Frederick Douglass’ home and the Smithsonian’s Anacostia Community Museum. Read full article here. Anacostia’s detached renovated homes, many larger than 2,000 square feet, often sell for $200,000 to $250,000, have porches with a view of the Capitol dome and are a quick Metro ride or drive from downtown. Similar-size homes in Mount Pleasant or Shaw sell for more than $800,000, said Darrin Davis, owner of Anacostia River Realty. But black professionals said more than bargain-hunting is drawing them to the area. They prefer to live east of the river, they said, because they feel at home in the black community and they like investing there. Still, skin color alone has not been enough to inoculate them against criticism that they are outsiders and interlopers. Anacostia has benefited from development brought by investment, but the G-word is still freighted with racial and class sensitivities. Some black gentrifiers said they feel some of the friction felt by whites when buying property in the area. About 3.3 percent of Ward 8’s 70,712 people are white non-Hispanics, according to 2010 Census data. That number is growing as more white professionals move in, Davis said. Background: In 1997, Davis used an inheritance to buy a Capitol Hill apartment building, then another, then another. Hooked, he ventured into home sales for five years. After a cross-country detour working 1½ years on Hillary Clinton’s, then Barack Obama’s, presidential campaigns ï¿½" when the housing market crashed ï¿½" Davis, now 46, returned to his real passion: D.C. realty east of the river. by Nicholas Westbrooks. The Manuscript. I referred to the Congress Heights on the Rise website and found the posting for the Anacostia River Realty’s second year anniversary. I went to the company’s website to see what was significant about the celebration. I found out the agency’s purpose is to change people’s perceptions of the Ward 8 neighborhoods. I then decided that that would be the angle of the story in connection with the anniversary celebration. I attended the event. Many people squeezed into a small room for the viewing party. I got my first interview from just standing next to one man. While we were waiting for the viewing to start, we struck up a conversation. After talking with him for awhile, I asked him if I could interview him after the show went off. ...Like many people, Ray based his initial perceptions of southeast on what the news reported and the conversations he heard about the high crime rate in the area. For the past three years up to his move into Congress Heights, Ray had been commuting an hour and a half from his Fredericksburg, Va. home to his job at Orr Elementary School on Minnesota Avenue SE. Although he worked in southeast, he had never thought about what the area had to offer until he met Darrin D. Davis. The store may be bringing jobs, but Walmart’s reputation as a low wage employer also precedes it. Still, jobs matter in Ward 7 where the Marshall Heights Community Development Organization says unemployment approaches 20%. Aliya Frieson, lives near Walmart’s projected East Capitol site. She sees many young people in her neighborhood who “have nothing much to do.” Not everyone likes Walmart, but jobs and development matter here. Darrin B. Davis, broker/owner of Anacostia River Realty, knows the criticisms of Walmart’s business practices, but adds “I’m all for anything when it comes to providing jobs” and spurring more opportunities in underserved East of the Anacostia River neighborhoods. ...Ward 7 location, home prices are significantly cheaper than they would be in northwest DC, said Darrin Davis, owner of Anacostia River Realty. Davis said that a three-bedroom home in the area sells on average for around $350,000, and that a comparable home in Georgetown or Capitol Hill “would probably cost close to a million.”... Darrin Davis pointed out that Anacostia and Deanwood, both located east of the river, have sit-down restaurantsï¿½"but so far, only one each. “Given all the [politicians] we’ve had living here, we should have had more services,” Adrienne, a 30-year resident told UrbanTurf, indignant about the lack of options. Anacostia River Realty to host screening of milestone HGTV episode in Anacostia. (Washington, DC) --- Anacostia River Realty, the D.C. real estate firm featured in the HGTV My First Sale episode filmed in Historic Anacostia, is pleased to host a public screening event, Friday, February 25, 6pm - 9pm, at Big Chair Coffee & Grill, located at 2122 MLK Jr. Ave, SE. The screening coincides with Anacostia River Realty’s Second Year Anniversary Celebration with special guests, the stars of the award-winning soap opera series, Anacostia. The selection of Historic Anacostia in Washington, D.C.‘s Ward 8 over more affluent and well-known Washington, D.C. neighborhoods was seen as further confirmation of Historic Anacostia’s status as the “next big thing” in community revitalization. To RSVP for Anacostia River Realty’s screening and anniversary celebration send an email to rsvp@anacostiariverrealty.com or call (202) 678-7325 x500. Attendees can also register online at www.AnacostiaRiverRealty.com. Anacostia River Realty (http://www.anacostiariverrealty.com/) formalizes residential, development and commercial real estate transactions. The company provides quality and professional real estate services to neighborhoods east of the Anacostia River. Darrin D. Davis, a licensed Realtor with over a decade of residential sales, property management and commercial real estate experience, is the Principal Broker/Owner. Anacostia River Realty is located at 2412 Minnesota Avenue SE, Suite 204 in the Historic Anacostia neighborhood of Washington, DC. Anacostia River Realty (www.AnacostiaRiverRealty.com), opened in January of 2009, the agent for 1214 U Street, is a full service realty company in Anacostia specializing in fine homes in East Washington, as well as rental units, according to Broker/Owner Darrin Davis. With six agents, Davis said the company has seen a maturing interest in East Washington properties over the past year. Two months, which was about the typical marketing period in the Washington area during the third quarter last year, may not seem like that long to have your home up for sale. But when you look at it as 60 consecutive days of impeccably made beds, hidden toys and sinks wiped spotless, time drags on. Of course, some homes lingered on the market much longer, increasing the tension on sellers. Average days on the market have actually improved considerably from when the bottom dropped out of the market, but they're nothing like they were in 2005, when contracts took less than a month and multiple bids were common. With forecasters predicting that the area housing market could stay flat for six months, sellers need to be prepared to wait, agents say. "You can have a beautiful house, but in this market, if it's not seen as a really good deal, they won't bite," said Darrin Davis, Broker/Owner of Anacostia River Realty in the District. Darrin Davis: Future Reality Star? ï»¿ï»¿ï»¿For those of you who follow CHotR (Congress Heights on the Rise) you probably recall that last year producers of HGTV’s My First Sale were filming in Historic Anacostia, well now we have an airdate! That My First Sale episode will air this Sunday at 1pm! For those of you unfamiliar with the series, My First Sale follows a first-time home seller and their real estate agent as they navigate the ups and downs of the real estate market. Sunday’s episode will chronicle the journey of Anacostia homeowner (and my dear friend and fellow blogger) David Garber as he attempts to sell a renovated single-family home in Historic Anacostia with the assistance of his realtor, Darrin Davis of Anacostia River Realty. The Advoc8te interviewed Darrin on his experience filming the show. See below for the interview and watch the show on Sunday to see what happened with the house! And in case you are wondering, David is in the process of purchasing two dilapidated homes in Historic Anacostia with hopes to have them on the market in late spring! TA: When did filming start? TA: How did you feel when you were selected to participate in the show? DD: I was ecstatic not only because HGTV was finally coming east of the Anacostia River, but also because Anacostia River Realty was the company that brought them here. TA: What was the filming process like? Would you do it again? DD: The filming process was intense. Even though it's a "reality" show, some scenes had to be reshot from different angles and reshot to give the editors more than enough footage to work with. Most of all it was time consuming, the average shoot lasted 3-4 hours. I would definitely do it again, but I'm working with Anthony Anderson, creator/director of the web series, ANACOSTIA-The Series, on developing a pilot for my company's own reality show called, "ANACOSTIA REALTY". It will be an uplifting, inspirational show about a new realty company opening in an area that's in the midst of a huge transformation. TA: As a realtor, what do you think this coverage means for the Anacostia community? DD: As a Realtor, this coverage is absolutely great for the Anacostia community! We are introducing the world to this great community and hopefully dispelling some misperceptions. TA: What has the response been like to friends/clients knowing you appeared on the show? DD: I've kept friends and clients involved in the whole process. From the audition, being selected, first day of filming to the completion and airdate. The question I keep getting is "when will the show air?” The buzz has been all positive. TA: Any special plans for the premier episode? DD: For the premiere, I’m having a small party with the Anacostia River Realty's agents. We are planning a very nice viewing party, which will coincide with our second year anniversary that will take place in the upcoming months. We will also be having cast members from the hit show, Anacostia: The Web series in attendance! The My First Sale episode featuring David Garber and Darrin Davis airs this Sunday, January 9, 2011 at 1pm on HGTV. Historic Anacostia Featured in HGTV’s My First Sale Episode, Sunday, January 9 at 1pm. WASHINGTON, D.C. ï¿½" January 5, 2011 --- The Third Season of HGTV’s My First Sale will premiere Sunday, January 9, 2011 at 1pm and will focus on the Historic Anacostia neighborhood of Washington, DC. The My First Sale series follows a first-time home seller and their real estate agent as they navigate the ups and downs of the real estate market. Sunday’s episode will chronicle the journey of Anacostia homeowner and blogger David Garber as he attempts to sell a renovated single-family home with the assistance of his realtor, Darrin Davis, owner of Anacostia River Realty. Sunday’s episode features the Historic Anacostia neighborhood of Ward 8, a community on the tipping point of economic and residential revitalization. In recent years, Historic Anacostia has become the option for savvy homeowners looking for affordability without sacrificing Washington DC conveniences. Already HGTV’s coverage of Historic Anacostia is paying off. Garber is in the process of purchasing two dilapidated homes in Historic Anacostia with hopes to have them on the market in late spring. Darrin Davis has been inundated with requests from potential homebuyers looking to experience what he calls “fine east of the Anacostia living.” In February, to coincide with their second year anniversary, Anacostia River Realty will be holding a special viewing party of the My First Sale episode. The excitement surrounding Sunday’s episode is of particular interest to residents of Historic Anacostia. “The fact that HGTV is in our neighborhood shows proof that the best days are ahead for our community…Historic Anacostia residents will be glued to the TV on Sunday night! Two Thumbs Up for Anacostia!” says Charles Wilson, President of the Historic Anacostia Block Association. by the Washington, DC Association of Realtors (www.WDCAR.com). The third season of HGTV's My First Sale will premier Sunday, January 9, 2011 at 1pm and will focus on the Historic Anacostia neighborhood of Washington, DC. The My First Sale series follows a first-time home seller and their real estate agent as they navigate the ups and downs of the real estate market. Sunday's episode will chronicle the journey of Anacostia homeowner and blogger David Garber as he attempts to sell a renovated single-family home with the assistance of his REALTOR®, Darrin Davis of Anacostia River Realty. 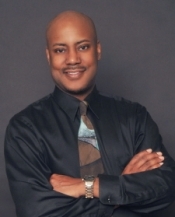 Darrin Davis: "As a REALTOR®, this coverage is absolutely great for the Anacostia community!" The DC season of HGTV’s My First Sale will debut this Sunday at 1pm, and rather than featuring a home in one of DC’s more popular neighborhoods, the show will chronicle the process of selling a renovated home in Historic Anacostia. My First Sale follows a first-time home seller and their real estate agent through the selling process. 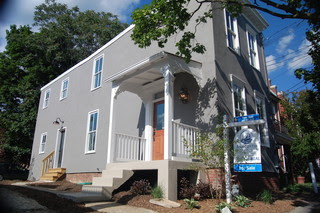 From July through October 2010, film crews followed David Garber and Anacostia River Realty’s Darrin Davis as they attempted to sell the home that Garber (the brains behind blog And Now, Anacostia) had spent eight months rehabbing and renovating at 1214 U Street SE (map). The production company for the show approached Garber about featuring his home after reading his blog and learning about the renovations that he had completed. The program should be interesting as it will not only highlight Historic Anacostia, but it will also chronicle the ups and downs of selling a home in a neighborhood that is coming back after being written off by much of the DC population years ago. When we first wrote about Garber’s home being featured back in July, we learned that part of the filming covered Davis and Garber discussing how the home should be priced. Davis pointed out the positives and negatives and the two settled on a price of $289,800. After a number of months on the market and a few price reductions it ultimately sold for $231,000, which while below the original asking price, was more than double what Garber paid for the home back in 2009.
and will focus on Washington D.C.’s Historic Anacostia neighborhood. “My First Sale” follows a first-time home seller and the seller's real estate agent as they navigate the ups and downs of the real estate market. Sunday’s episode will chronicle the journey of David Garber as he attempts to sell a renovated single-family home with his realtor, Darrin Davis owner of Anacostia River Realty. In many neighborhoods throughout the Washington area, nothing says community more than street-wide decorating, when just about everyone on the block gets together and starts stringing up holiday lights...Some Realtors, such as Darrin D. Davis, Principal Broker and Owner of Anacostia River Realty in Southeast Washington, caution that any decorating could make the wrong impression. But for longtime residents of Old Anacostia, where a lot of community energy goes into decorating the whole street, cutting back can be difficult for the homeowner who has put a lot of time, effort and tradition into the presentation. The first thing that becomes apparent upon meeting residents is that Fairlawn isn't necessarily Fairlawn. Sure, the Fairlawn Citizens' Association has clearly outlined the neighborhood's boundaries on its Web site, but talk to people who live there and you'll hear a number of other names for the area...Darrin Davis, owner of Anacostia River Realty and a Fairlawn resident, says he thinks the neighborhood is on its way to becoming the District's next "it" neighborhood. "We get calls about it every day," he said, adding that several retail and office spaces are slated to be redeveloped soon. "It's one of the fastest-growing area east of the river". by Amanda Abrams. Urban Turf blog. We're Washington, DC's W*USA Channel 9 official east of the Anacostia River real estate partner! featured in the award-winning web series, ANACOSTIA-THE SERIES. See clip here! Click here for the Anacostia River Realty Network!